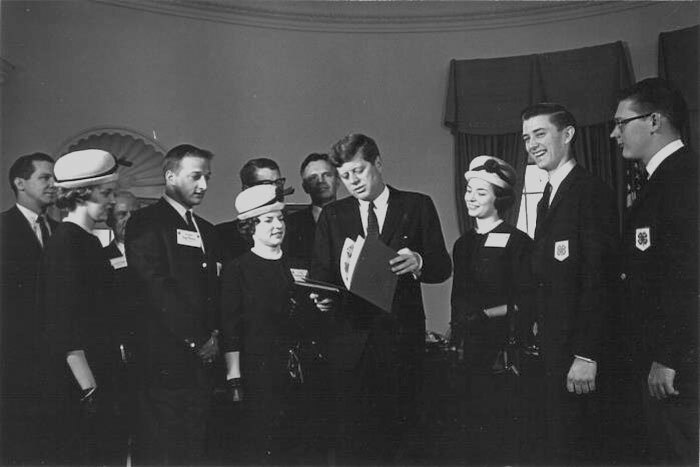 President Kennedy looks at the 1963 Annual 4-H Report to the Nation as the team looks on. L. To R. – Alice Todd, Tony Mellor, Veronica Vamosy, Faye Craig, Larry Pressler and Don Weeks. For over four decades the National 4-H Report to the Nation Program was a premier high visibility program. Initiated in 1950, each year the program offered a team of young people an opportunity to represent their fellow 4-H’ers in telling the 4-H story. They met with corporate executives, with governors, congressmen and with Presidents of the United States. They were on network television in New York City and “did Hollywood” in California. The National 4-H History Preservation Team is attempting to write the history of this exciting program and document those who participated. Unfortunately, many of the national records are gone. For some years we don’t even have the names of the team members who participated. However, we know there are people across the country who will remember… some who may have even been on one of these teams! Please read this over. If you can help us locate some of the Report to the Nation team members – either those listed, or others who are not yet on the list – we would appreciate it. We want to get their stories. Not only do we want to complete the listing of the annual teams, but we want to know what each team did… it varied greatly from one year to the next. Earlier this summer members of the 1963 Report to the Nation team returned to the National 4-H Youth Conference Center for a 50th anniversary. A digital video made of their recollections can be found in the digital video segment of the Film & Audio Archives on the website at: http://4-HHistoryPreservation.com/Media_AV.asp We would like to see reporters from other years consider a possible reunion, as well. Please contact the History team at: info@4-HHistoryPreservation.com if you participated in one of the reporting teams, or know of others who did. Thanks.